This is an important piece because I consider my presentation of the resonances in the Solar System as the proof of the validity of my method and my specific mathematics as put forward on this website. This presentation of the solar system resonances is different from the usual because it employs a mathematical natural number logic which is not (yet?) accepted in established mathematics. What this logic does is bring to the surface all manner of hidden mathematical relations between several aspects of the different planets which could imply that some base-pattern was already in existence according to which the free floating ‘material’ in the solar plane was proportioned during its formation. At least that is the only way I can explain for one thing the progressive ratios in the masses of the planets. It is hard to deny the regularities that come to the surface and there seem to be even more hidden resonances than what I give here, but only these here can be sufficiently argued. What follows is probably the most solid scientific proof so far of the validity of the peculiar 9-number arithmetic and its accompanying geometry as set out on this website. What at first only seemed a peculiar and simple way of doing geometry, now turns out to lie at the heart of the dynamics of the solar system, which proves at least two things: a) that the mathematics, however unusual, is valid for physics (i.a. gravity) and b) that it uncovers underlying relations in ratios and resonances which no other system can bring to bear. I show how by making small systematic alterations to the official data (up to less than 3%, except one at 5%) these can be reshaped to fit a mathematical framework (progressions) and dynamic which serve compelling evidence for this underlying 9- (and 10-) number order. This adaptation of data is justified because we deal with an ever changing dynamical system where accidental (catastrophic) occurrences may influence (disturb) the overall interactions throughout the system for long periods of time. The most enigmatic fact to come forward from these new data arrangements is that the masses of the planets can be seen to relate in specific mathematical whole number ratios, again based on the number 9. This would seem to imply that a mathematical resonance pattern was already in place before the actual planet-formation took place, this pattern then would have to have emanated from the Sun’s body proper and most probably be caused by the differential in rotation speeds of the core and the equatorial rim (the sun’s poles and probably its core axis rotate in 36 (=6²) days, the equatorial rim rather faster in 25 (=5²) days, so this will produce a layered vibration in its mass and consequently in its inertial deep-field. The 9-fold order in our mathematics is to do with the horn-torus-formula (4.π².r²), here called corus-formula, [corus = core-torus = horn-torus) and its specific π²-value as the rational number 800/81 [8 x (10/9)²] or 9.87654321 (=π²), this is the absolute ‘core’ value of our system based on toroidal integer mathematics. (canonical π²= 9.8696…., diff 0.0069..). 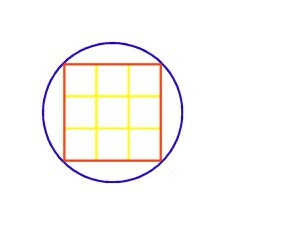 The 10:9 ratio is expressed in our core-logo for natural number-geometry (see pictogram below, orange is a square perimeter 9, symbolized in the yellow grid of 9 squares, blue is a circle circumference 10, symbolized in the decimal zero, a circle), where the circumference of the circle and the perimeter of the square relate as 10 : 9 exactly (consequently also ratio -> quarter-circle: square side = 10 :9). The data that sustain a 9-number order are overwhelming and this makes a very strong case for my approach, however unclear at this moment all this theoretically may be, but the numbers themselves lead the way again, as they always do in this system. Remember that resonance is a ‘not-precise phenomenon’, but functions within margins of tolerance which is the reason why this unusual but beautiful approximation system proves to be valid in reality. It is flexible, not rigid. As we will see the majority of ratios has the number 18 (2×9) as prominent characteristic factor. Look to begin with at the following progression in ratios of selected masses (mind you, the bodies) of some of the planets and the Sun and the deviation from the official data in percentages, which we will work out later. the Moon has a mass 1/81 (1/9²) that of Earth, while Mars has a mass 1/9 that of Earth, Mercury 1/18 and Venus 81/100 (9² /10²) the mass of Earth. It all fits the resonance pattern of the torus geometry with 9 : 10 order. Why this is so important is because it shows so clearly that there is more to gravity than Newton’s and Einstein’s insights reveal, it means gravity is not really understood at all still and here we thus have a very ‘familiar’ example where the 9-fold resonances of the toroidal geometry are expressed in the experiential data. We are talking about the masses here, don’t forget how extra-ordinary that is! So how did it come about? Possibly computers can do the job when this system is made fully operational in a program. What this all means is that the mathematical part seems the decisive influence and that, by itself again, is why this mathematics is so interesting and important, because if it is possible to analyse the ‘mathematical creation’ of the solar system, then it’s origin may consequently have more transparent data to build a theory upon. Also here we see rather small real deviations from the theoretical data, all still under 5% and usually much less. It all depends on how you imagine the solar system has developed, where it got its geometry from, and all its resonances. I come with the double star option, because I don’t want to resort to the usual ‘catastrophy’ (the supernova) as a cause. The point is that my method shows there must have been much more ‘mathematical engineering’ than probably sceptical scientists are prepared to accept; I see the ‘miraculous’ in the mathematical, but most of them, sadly, ‘don’t see no miracle at all’, anywhere, it seems. The universe as I see it is unique and cannot be otherwise because it is based on the intrinsic logic of numbers as representatives of basic vibrations, so ours is not ‘the best of all possible worlds’ as Leibniz thought, but ‘the only possible world’. We see this also in the ‘dimensionless universal constants’ as I pointed out elsewhere, they are mathematical necessities. This is the miracle, that it numerically really makes sense. For instance: what I found in the archaeology of Orkney and then compared with the pyramids of Giza cannot be explained rationally, but neither can it be properly labeled as ‘coincidence’ given the mathematical character of it all, and the fact it occurred at about the same time, so it all retains something of the enigmatic, the miraculous, the supernatural (and then, is there anything wrong with that?). Here for the first time emerges the scientific value of the 9-fold system and natural number-geometry, these mathematics bring the deeper lying connections, the ratios and resonances to the surface. In my view it are these ‘hidden mathematical networks’ which are the backbone of the solar system’s long term stability, a stability which has always been and still is questioned and probed by scientists. Sure is that scientists have great difficulty in making calculations in gravity systems where more than two bodies are involved, let alone nine. Maybe these, now revealed, deep-field resonances and the concept of pressure-gravity can help to clarify the picture. Without the here employed analytical number system scientists miss out on a whole range of resonances which may govern the internal coherence of the solar system as a whole, as is shown in the data below. It are these ratios and resonances which probably function as an elastic glue and keep the system ‘organically’ together; they are a safeguard against disintegration, they even-out irregularities in deep space, the aether (that is: deep-field-transformation). When it comes to the origin of the system as a whole I have, as ever, a different story from the accepted scientific paradigm which needs a supernova explosion to explain why there are these high concentrations of metals in the system. It is all this catastrophe-thinking, like the Moon formed by a collision of Earth with some stray planet or like Uranus’ extremely tilted axis occurring from some other catastrophic impact that hampers deeper analysis. But I don’t accept easy (lazy) catastrophe-thinking, so I have developed my own, still unfolding, story: I opt for an origin in a disintegrated double star system in which most of the Sun’s twin star was absorbed by the sun. This was eventually a process of huge tidal forces in which temperatures and pressures occurred that created the heavy elements and in which process large chunks of plasma got ripped off the ‘cannibalized’ double star and ended up in the solar plane where possibly the geometrical matrix of the original double star system still lingered on and shaped the proportions and relations in some slow transition. In these evolving conditions the masses of the different planets were proportioned along mathematical ratios of the earlier double star resonance system. Maybe the asteroid belt between Mars and Jupiter was the orbit (in the last part of its life?) of the disintegrating double star, of which the molten core was then eventually transformed into the 4 rocky inner planets and the huge blown-away gaseous parts eventually clustered together in the four outer gas giants in what seem mathematically pre-ordained orbits. So that is what this article is about, how there is definite mathematical order in unexpected aspects, yes, even in the relative masses of the planets, as said and shown, and that Earth, Venus, Mars and Mercury were part of the original core of the destroyed twin star of the Sun. [The astronomical term ‘cannibalism’ is used when one way or another a star/galaxy absorbs parts or most of an adjoining star/galaxy, it is an unpleasant name for processes of absorption that can also be seen as ‘growth’ and sometimes ‘rejuvenation’. (It is not attractive to base one’s -spiritual- cosmology on ‘cannibalism’). It has recently been found that our own galaxy probably absorbed another much smaller galaxy a long time ago. So these processes of accumulation are on-going and are an intrinsic property of the cosmic system]. Stars also cluster in larger groups. Many stars the size and category of the sun are involved in binary or even multiple star systems. Many of the stars we see with the naked eye are on closer look, close-knit multiple star systems seen as one star, so it is quite common for stars to group in multiples, so why not our Sun. This picture of the movement of the barycenter is misleading in the sense that it is not the barycenter which moves around the Sun, but the other way round, the Sun and all its planets actually revolve around the barycenter (center of gravity). It turns out that the Sun’s movement around this center is mainly influenced by the mass of Jupiter as can be seen in striking animations of the influences of the individual planets on the behavior of the Sun. 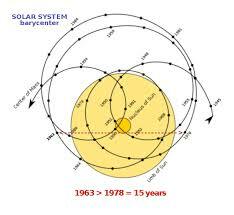 Below is the actual movement of the sun around the barycenter mainly due to Jupiter’s influence. (see link)(http://homepages.wmich.edu/~korista/solarsystem_barycenter.pdf ). Given that Jupiter’s mass is only 1/1000 that of the Sun it is remarkable how much influence Jupiter still has on the Sun and consequently on the whole system. Also the influence of Saturn is substantial, whereas Uranus stands out as being the planet of which the period around the barycenter exactly matches that of the Sun. Neptune although only some 20% heavier than Uranus and twice as far away (!) has a bigger impact on the Sun. It is tempting to suppose that the awkward tilt of Uranus – its axis is nearly horizontal with respect to the solar plane- is actually due to the strain Neptune exerts on the whole system and the Sun. What we see here is not only that the outer three planets data are very close to the theoretical prediction but that there is this whole mathematical grid clearly within margins which are scientifically acceptable. It would be odd to ignore this. Only Mars is 5% off the mark, so what? It is a very small planet without much consequence but possibly vulnerable to disturbances of the rather ‘messy’ asteroid belt (which has itself a strict 45m grid though). So given the dynamics of an ‘organic’ system, which, so to speak, ‘must’ be irregular to be ‘real’ at all, the fit is remarkably good, so good it is a kind of proof of high probability for the theory. The orbits of the outer planets show they form a progressive geometry, without substantial center in principle, (0, 45, 90, 180, 360, 720, 1440, 2880, 4500 is the basic progression) but this grid is ‘de-formed’ by the mass of the Sun regarding the interior orbits, even including Jupiter, which have been pushed away by some 60 million km. (60, 105, 150, 240, 420, 780), but retaining the successive doubling of the 45 million gap-factor. The grid of the even numbers is still visible in the orbits of Neptune 4500, Uranus 2880, Saturn 1440, respectively 100, 64 and 32 times 45 (million kms), a nice progression. This unit of 45 million turns out to be the factor which decides the spacing in the orbits of the planets. Since Neptune is the outer orbit at 4500 (million km) it seems the factor has to do with the overall diameter of the system and is in any case 1/100 of the radius of the Neptune orbit in our system, measured from the heart of the sun. This is of course a significant fact, because it confirms a mathematical standing wave order in the orbits and the emergence of the factor 10; all the other orbits are a doubling of the power of 2 and again we see that the orbits follow a factor 9 cycle. Our model just fits perfectly. I have to remind you that what I present is the basic geometry, but since it is a system which is not immune to some catastrophic impacts, such calamities can breach the balance of the system and reverberate over many, many centuries having an impact on the wider environment, in general the system will be built in a way that is capable of absorbing local catastrophes, which certainly do exist. It is only on the scale of Saturn, Uranus and Neptune, where the distance to the Sun is so vast and the initial pressure of the sun does not reach, that we see the basic geometrical grid coming into its own. Our Solar system presents itself mathematically very orderly to its own wider environment (notwithstanding its slightly ‘chaotic’ innards) and it may be even partly shaped by that wider environment as well. Here follows a text from 2003 slightly modified and improved, about the number-9 patterns of order in the solar system. We have to realize that the data are averages of elliptical orbits which are not completely in the same plane (co-planar), so it all moves according to geometries with some real systemic frictions that can be theoretically ironed out by our simple whole number relations, which would represent the underlying long term resonances and logic. In a sense the inner concentric order is pushed out of center by the distance of Mercury to the Sun (58, but taken as 60 million in our theoretical model) and it is only starting from Mercury that the concentric circles are observable in the range of 45 million km gaps: 45, 45, 90, 180, 360, 720 (660), 1440 , (1620). Venus as the first distance at 50 million km from Mercury, pushed away not by 45 or 60, but by 50 million km to 108 million km (3% off t-value 105) from the Sun, Earth at 90 pushed to 150 (data 149,6; 0.25% off), Mars from 180 to 240 (data 228, 5%), the asteroids from 360 +60 to 420, pretty spot on and conspicuously then in the rest of the asteroid belt in neat bands of 45million gaps (see below); finally Jupiter from 720 + 60 to 780 (data 778, 0.3%), so there is an ‘original’ pattern of progressive doubling by a factor of 45 million, this is disturbed by the presence of the sun which triggers the initial push out of about 60 million (58 million) (Mercury) and this push-out of 60m extends all the way up to Jupiter, the major influence in the stability of the system, so it seems as if a complete pattern is homogeneously expanded with one factor ( of about 60 million) over the inner solar plane including Jupiter, excluding Saturn etc. This push-out must be due to the radiation of the Sun, but there is more to it one suspects. There is this relation of 58 million for Mercury and the diameter of the Sun being 1.4 mil, which is a factor 40. These different values may all have to do with the differential rotation speed of the mass of the Sun and its internal vibration; anyway there is suddenly more to these data then there was before, that is the main point. Especially the asteroid belt reveals the concentrations of matter between gaps of about 45 million km, which supports the here supposed overall standing wave pattern of the solar system; the main concentration of asteroids is at about 420 million km, then another major concentration at about 465 million km and smaller rings at 510, 600, 645, all in the 45 million pattern, coming from an excess of the initial 60 million from the sun (420+45 = 465 +45 = 510 +90 = 600 etc). The interesting thing here is that the orbit of Saturn lies about where it should, so without the outward pressure of the sun, it should theoretically be at 1440 , it is (now) at 1427, less than 1% off the t-value, and Uranus makes good by being near perfect at 2870 instead of 2880 (0.3%), Neptune completes the ring-system as ninth orbit and as eighth planet at the enigmatic, but very precise, 4500 million km mark (4497, 0.0%), which is 100 times our initial unit of 45 million. Who can deny there is a transparent order here once we slightly adapt our numbers? What we see on the first number row is the scientific orbit radii data in millions of kms, with Mercury’s orbit as 0. The second row gives the ideal proportions on theoretical geometric and wave grounds, but because we deal with a dynamic system you can kind of feel the stress in the data, once you can discern the progression, but still we see that the differences are small, not exceeding 13 million (Saturn, less than 1%), and sometimes nearly spot on, so the logic is in place, the model fits. We have to keep in mind that these radii numbers are averages of elliptical orbits not exactly in the same plane. The third row gives the actual progression of doubling, so that regards the standing wave of gravity I like to mention. We see that the 60 million outward push reaches unto 778 mil but does not go beyond Jupiter and with Saturn we are truly back in the original logic of the geometrical frame (720-60=660). So the solar system’s outward appearance in the outer three orbits is orderly and shows the keys to its inner mathematical order. You see that at the orbits it all regards doubling except for what is the outside orbit of the system, the closing geometry, so it is as if you have a 11 : 7 doubling mechanism in the inner orbits, and then 10:9 resonance mechanism at the outer orbit as the closing ratio; this also fits the 11:27 ratio. Computers must be able to make some pretty interesting dynamics out of that. The moon revolving in the Encke gap at 2,21 Saturn radii, which is 1,1 Saturn-diameter from Saturn’s centre, and has accordingly a value 11 in my system, is probably a point-like accumulation of regional debris that has formed by the particular resonance of the gap itself. It is shown in pictures how streams of debris from the rings ‘fall down’ on this moon and other moons. So you see this point-like concentration and accumulation of matter over and over again, it is the most primitive form of ‘growth’ in the universe. Similarly our Moon may have formed out of debris in the Earth’s area and ring-system. In my view the early Earth is part of the heart of a disintegrated twin star of the Sun. All the matter of the planets would have come from the core of this star which would for the gaseous part mostly be ‘cannibalised’ by the sun. So the body of the Earth comes from the core of a star, a star which eventually collapsed on itself and then explode or got ripped apart by gravity tides and transformed into a planetary system; which raises the question whether this mechanism is much more widespread. In this explanation there is no need for another catastrophe (supernova) to explain the anomalous abundance of metals; they come from the core of the twin star when it exploded in its final stage of annihilation. It seems the masses accumulate orderly by the geometry of the local space to reach a certain proportional value in the system, so that, in a sense, the system itself is constantly growing and getting better balanced, and even the planets may be seen as the result of a geometry that forces the accumulations of energy (planets) through certain geometrical corridors (tori), their orbits. We see here the number 9 occur as factor in every ratio and it continues with only Saturn as independent. How come all these nice familiar and totally matching numbers ? The Kuiper belt is here considered the most visible indication that the solar system hangs like a gyroscope in the ring of the Kuiper belt which represents the local geometry of a much larger inertial field, that encompasses the solar system but spreads further into the local geometry of the galactic field. It should be noted that these extraordinary ratios are mostly correct to within 0-1%, only one at 5%, difference from the projected values on the basis of the mathematical expectation. So the model is again sustained by the data here. Moon 0,0123… 0,0123. ( 0 ) 0,222.. The number 18 is prominent here, but remember this is about the masses of the planets. This cannot be otherwise interpreted than that the original mass of all the planets together was stretched out over the plane and the resonances of the complete field made the mass subsequently collect in certain mathematical proportions. In my view the planets are remnants of a twin star of the sun which has been destroyed by the tidal forces of the sun and once torn apart big lumps started to generate a standing wave system out of which the planet masses grew to the proportions that we see below. There is a very prominent display of affinities between the different planets along the lines of our mathematical model. It is not difficult to point to all the striking relationships in this mass spectrum of ratios, but it is not at all clear, how this has come about and stays organized. The indication of mathematical order along these lines is overwhelming and it seems to me it should be a challenge for science to understand this order and how it came about. The point here is that the field’s major geometry has a mathematically harmonic basis, a standing wave pattern of resonances and that substance is accumulated there where it fits the logic of the pattern, vibration next to rest. In the ‘rest-tubes’ is where the debris of the stars collect and find their place as part of the rings. A historic example of the definite patterns of standing waves gave the scientist Chladni to Napoleon by producing for different frequencies different intricate geometrical patterns of dust on a vibrating plate using a violin bow, the dust collects where there is rest, no vibration. It is also a vivid example of the geometry of space. Even the densities come into play and again one can detect a mathematical proportional relation that is fixed around certain values although what this rhythm means as expression of the whole is as yet difficult to say, but I am sure, that the patterns given here so far will yield some interesting internal mechanisms and mechanics. A further example of division by nine and 9-fold geometry we find in the orbits and dimensions of the four major moons of Jupiter. These four giant moons each bigger than our Moon and one even bigger than the planet Mercury, the third ring moon Ganymede, revolve in a plane surrounded by at least 12 other smaller moons. 9) model correction (less than 3%). Only Europa seems a bit out of step (6%), but this may also be a ‘temporary’ case or may have other as yet hidden causes. A near miss of a giant stray meteorite may, by its temporary ‘attracting’ lee-field bring imbalance to the system, where it hits on the level of inertia and long term absorption, which may affect the anomaly in the system as we see it in Europa. It is known that Io has violent volcanic eruptions which are ascribed to the vicinity of the giant planet and the tidal strain this entails. There is no better way of showing the gigantic stress an invisible and as yet ‘un-measurable’ field, the deep-field, can bring to bear on local geometries of a passing mass than the agony of a stressed Io.